I would like to share a little story which started in Khumba Mela. I was sitting across Mohanji in the TukTuk leaving the temple of Saturn. I told him I struggle to feel and understand the relationship between Sai Baba and Sathaya Sai. He smiled and with a small nod of his head he said not to worry I was not ready and would soon understand. Just two days later, I received, out of the blue, a book from a friend called “The Divine Life” which brought much clarity. On Saturday at the Datta Tapovan Ashram during a celebration for Mohanji, I showed a picture of Mohanji’s biggest devotee, my cat Garfield, who loves sitting in the temple at home, on my cellphone to other devotees. I went into total shock when I suddenly observed a face form on the picture of Mohanji. As Mohanji said – I will know when the time is right. The lofty Himalayas and their lore have since very long enchanted my whole being. I may live in any part of the world but my heart dwells amidst the rugged topography of the mighty Himalayas which I believe are the holiest of places and thrived by the live presence of many immortal saints. Revered Guruji Mohanji was on his visit to Rishikesh located at the foothills of Himalayas on the day of Janmashtami to perform ‘shraddh’ of his beloved daughter Ammu. I had not known this before. As per my regular habit of keeping in touch wih Guruji on messenger, I conveyed him Janmashtami greetings. Within a few moments he replied that he was in Rishikesh. I felt great about it, firstly because Guruji shared with me, kind of a personal information regarding his whereabouts, and secondly because he was at Rishikesh, my most favourite of all places. 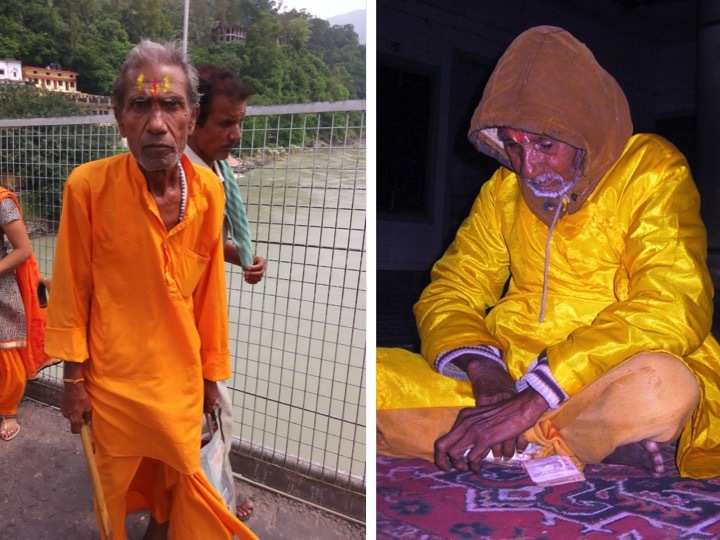 (Since my in-laws house is in Dehradun, I visit Rishikesh almost every time I go there). For the past few days I had been motivating one of my cousin sisters, who lives in Dehradun to follow the path of Mohanji. She was experiencing certain turbulence in her life. So as soon as I came to know that Mohanji was in Rishikesh, I immediately conveyed it to her. She was extremely fortunate and blessed to have a chance to connect with him. How my cousin felt being on cloud nine that day and how her life changed after that, is another story. Coming back to my own, a few days later I noticed a post on facebook in which Mr Rajesh Kamath who had accompanied Guruji to Rishiksh, had written a recount of their visit. I was awestruck at the divine incidents which took place in Rishikesh including the physical presence of Hanumanji and Shirdi Sai Baba. I saved the image of Hanumanji which was uploaded in the article on my mobile phone so that I could have ‘darshans’ whenever I wanted to. The same night I got an idea of singing Hanuman Chalisa looking straight at the image that I had saved on my phone. I did that with quite a devotion. The next morning again I did the same. I was also telling Hanumanji that since we all have such different images of his physical form, it’s hard to believe what he was looking like, and prayed to him to help me with that. As I continued looking at him, I saw his face changing forms and ultimately taking the form of his ‘Vaanar roop’ – the monkey form. Suddenly a very strong cool minty feeling covered me in my mouth, in my head, up to the back throat cervical region. It was as if I had consumed a large quantity of mint. The feeling stayed with me continuously for at least a couple of days and whenever I ate anything , there was no other taste other than that of mint. Hanumanji sure had blessed me. I wrote this experience to Guruji Mohanji and asked him of what that minty feeling was. In his reply he kind of scolded me for why I needed to ask that question at all, wasn’t it a confirmation anyway! Along with this he also sent his love. My joy knew no bounds after receiving validation from the one who was clearly behind this miracle experience. My heart overflowed with reverence and gratitude to the one with ‘ashta siddhi nav nidhi’ and to our respected omniscient, omnipresent, incomprehensible gurudev Mohanji . With immense gratitude I want to share two recent experiences of how Father “Mohanji” watches out for all of us and in his own beautiful unusual ways keeps guiding us . I have been staying in Mumbai for the past couple of years and last week moved back to my home town Jamshedpur where my parents stay. With Father’s permission I want to set up a center here facilitating meditations, Conscious Walking and Seva activities. To initiate it I decided to go for Conscious Walking the day before, along with my parents. We, especially my parents, had a hectic day so I volunteered to wake them up. I was to put an alarm for 5am in the morning. But just when I went to bed I received a call from a friend and after finishing the call forgot all about the alarm and just dozed off in seconds. Suddenly in the middle of the night I got up and the only thought I had in my head was I had not set the alarm. I checked the time and it was 3.15am. And the next thing that occurred was that it was Father who woke me up to remind me about setting up the alarm which I did at 3.15am. So that I don’t miss my first Conscious Walking, especially when I have taken the responsibility to facilitate it. It’s difficult for me to explain but I actually experienced his guidance during those few minutes when I got up in between that deep state of sleep. Had I not woken up, I would have felt I let myself down but that’s not possible when he is watching out for us. I was careless about the alarm but the intent for the Conscious Walking was genuine and strong. Father ensured what was intended got materialized. So we had our first lovely successful Conscious Walking even if there were just three of us. Even more amazing was an incident that took place the next day. Yesterday, yet again I overslept having slept late. I was supposed to get up early, meditate, go for a walk and then finish some work. But at around 6.50am my mother noticed a maina (bird) in the balcony outside my room, who was refusing to go and it kept knocking at the air conditioner of my room. Out of the blue my mother had a thought (which she told me later) – that Mohanji had come to wake us up, so we could start work again. And just then she called out to me, asking me to wake up and co-incidentally I had just woken up. Also I checked with Father, when he confirmed that it was him, and followed by motivating me to work hard and wake up, which clearly means to get going with my responsibilities. I was so amazed and actually it was a reality check for me that father with all his many children, takes care of them individually. So the least all of us can do is to be honest in our efforts. It’s humbling of how he makes us realize his presence in our lives and gives us assurance that he is here to guide us even when our behaviour is sometimes stubborn, irresponsible or reckless . One important lesson to learn is to put in our best of efforts and results will flow. Amazing are his ways to teach us the very simple but very important lessons of life which we sometimes forget or ignore. Love you Father. I am an ardent devotee of Mohanji and would always follow his Facebook posts closely. These posts increased my yearning to be with Mohanji and experience firsthand his energy and aura. Kumbh Mela gave me one such opportunity. My only problem was that it lasted for almost 7 days, and it was impossible for me to leave my 6-year-old son and come. But I had this earnest intention and left everything to Mohanji. I wanted to visit Kumbh basically for a lot of reasons. First and foremost was to be with Mohanji. The dip in the holy river guided by Mohanji, visit to Shirdi, visit to the Dandakavan and the biggest desire was to meet the holy saint Vasudevanji in Ganeshpuri – all this along with Mohanji. What more do we want? Somehow things started falling in place and I saw my Kumbh dream coming true, but for a short while, as my partner from Bangalore – Nirmala wanted to come back just after visit to Shirdi. That is just after 3 days, and I too agreed, thinking if it’s Mohanji’s grace for a short duration so be it. But Mohanji knows all and fulfills everyone’s desire – this just got reiterated during the trip. I was longing to stay for the entire trip and made my sincere wishes and surrendered to Mohanji to decide my course. So Nirmala from Bangalore and I left for Mumbai and reached Madhu’s place around 1.30 PM. As soon as I entered the apartment complex, I suddenly remembered a dream where I had visited this exact apartment complex in my dream some time before. It was quite a shocker to me. I always remembered this dream, though we forget many of them all the time. It probably did have its own significance. Here I would like to quote some of the most important experiences – though all of the experiences were amazing by themselves. 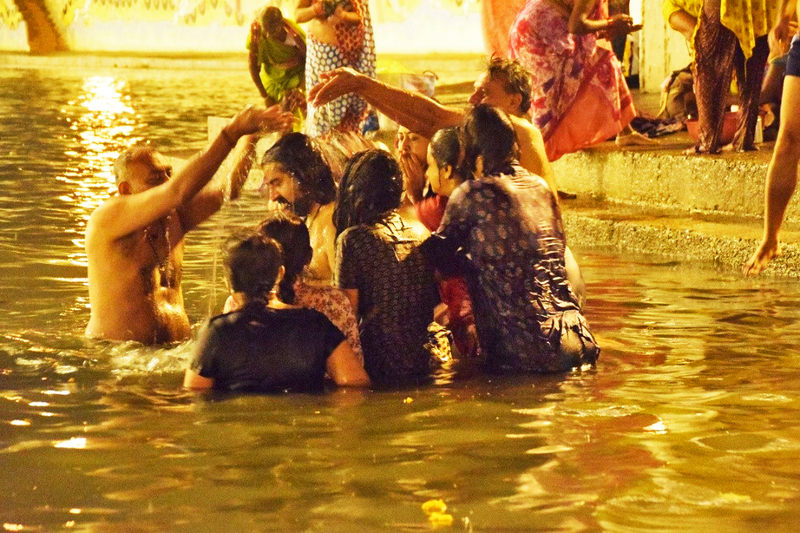 One of the first and best experiences were – Dip in the holy river Godavari. 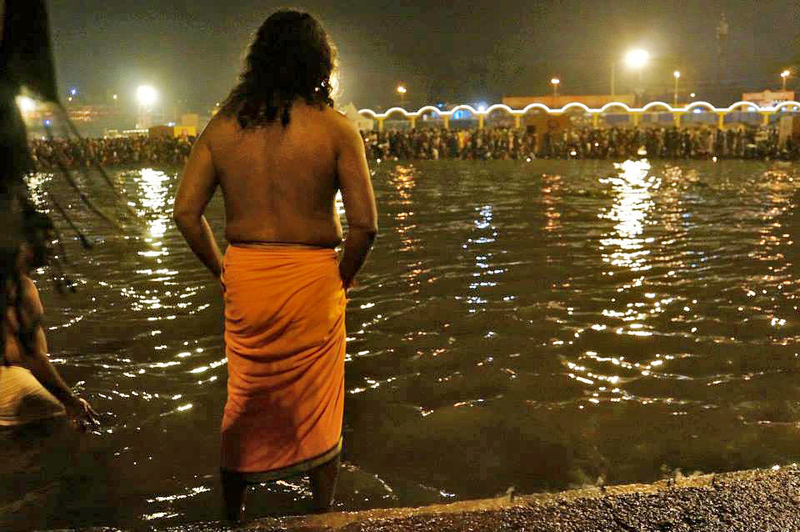 This was my first Kumbh Mela and the first dip, so waiting for this had built up in me, and I anticipated a huge crowd and drama, considering all the news we read about millions of people coming in for the dip, too crowded, be careful, no place etc. On the first day, all of us reached the spot at around 3.30 AM. I was dumbstruck looking at the huge crowd so early in the morning at the ghats. But surprisingly, the ghat side where we entered was relatively free and there was just enough space for a crowd of our 30 participants. Mohanji quickly got into the river. I hurriedly scurried behind him along with others. I had never taken a dip full head down into any river, and it was a frightening event for me. I gathered some courage, held my nose and tried to dip full head down. Water gushed into my ears. I didn’t know how to hold my breath and I panicked and came back up, without submerging even a half of my face in water. I tried several times with the same effect. My mind started calling me a loser. By the time Mohanji had already taken many dips. Since I was standing right next to him, I gathered courage and asked him to hold my hand for the dip. He instantly and firmly held my hand, and I started taking the dip, and his strong hands held my head and pushed me into the water completely. And this happened not once but thrice. 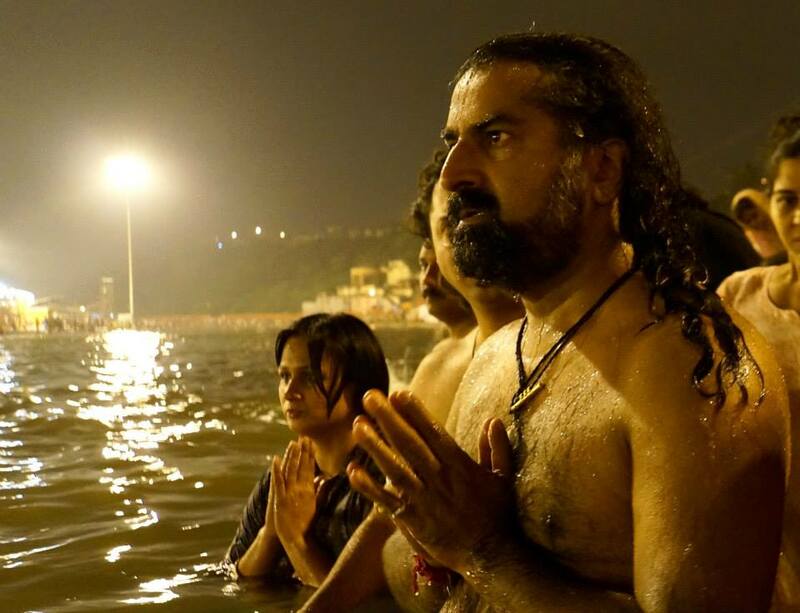 Lo and behold – all my fear of water now gone, I was feeling blessed as Mohanji himself helped me take the holy and the sacred dip that I was yearning for. I learnt a lesson – Hold your Guru’s hands with firm faith and he will take you across your wildest fears and the ocean of this existence. Thanks to Mohanji for this wonderful experience. We were all already in a bliss state and so enthralled that we were done so fast and already heading back to the hotel. This couldn’t have been possible without the presence of our ever loving Guru Mohanji. People already started talking about the next Shahi Snan on Sep 18th. Since mine was a short trip, I was terribly going to miss this unique experience with Mohanji. I wanted to be a part of the next Shahi snan very much. But I left it to God and Mohanji again. Next day we visited Shani Singanapura and the entire group along with Mohanji was taken to a raised platform opposite to the Swayambu form of Shani God. We all sat for the Pooja. I was very happy that this Pooja would be done for all of us here. By then, the priest of the temple informed us the Pooja preparations would take a long time, and hence could be done only the next day. Oh…and my heart broke as I would be leaving for Bangalore the next day, and would not be able to participate in the Pooja. By then my fellow travellers gave me some valuable advice, that I should not miss this opportunity and I should not worry about what others would think, since it was my journey and I should make things possible for the best results. I was still thinking about it, but was not sure about how people back home would react. Finally I called up home, and they reluctantly agreed to it and said they would take care of my son and not to worry about him. 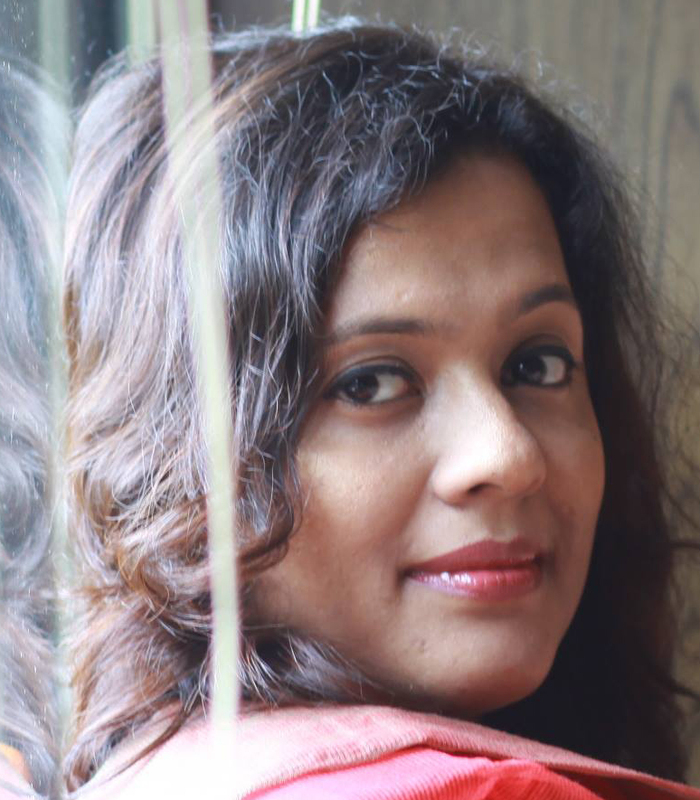 At the same time, my fellow partner from Bangalore Nirmala was not used to travelling alone, and if I stayed back, she had to travel back alone. I knew she would not like it in the least, and I didn’t have the heart to leave her alone. Finally when we were all travelling back from Shani Singanapur to Shirdi, Mamuji started telling amazing stories about Mohanji and his leelas. I was so awestruck again, and my urge to stay back for the entire trip, only got stronger. I silently made a prayer to Mohanji to guide me in the right direction. Other travellers in the TT started asking me whether I had made up my mind and if I had spoken to Nirmala. Nirmala happened to overhear this conversation and immediately turned back to enquire about it. Madhu did all the talking for me and though initially she was not at all happy that I was ‘ditching’ her, she agreed. My joy knew no bounds. Finally here I was – going to stay back for the entire trip as I had wished, but also getting the bonus of having the grace of doing the Pooja. The last seal for my staying back was postponing my flight tickets, which I was not sure how to do. Went back to the hotel and found my phone not working at all. Thankfully the reception guy of the hotel, so kindly told me that I could book the tickets using his system and take printouts too. There I sat for an hour, cancelled my Tuesday ticket. Next task was to book another ticket for Friday. I had already lost some money. Surprisingly while I was browsing for flight timings and prices, there was just one slot (which was of my choice too) that had half the price as other timing tickets for the day. It was unbelievable as booking the ticket just 2 days before the flight, would cost much more than what was offered. Another grace from Mohanji and an indication too, that I was doing the right thing and I finally booked my tickets. Came back to room relieved for the same and thanking Mohanji with all my heart. Another lesson learnt – have firm faith and intention – anything is possible. Next day we left to Shani Singanapur from Shirdi, after the darshan in Shirdi. All the while, I had the opportunity to travel with Mohanji in the car, and it was a blessing in itself to be in close proximity to my beloved and powerful Master. His sheer presence was enough to elevate my spirits. All the while, I was also very scared to talk to him, lest I speak some nonsense. So most of the time I kept things to myself except from some casual talk here and there. The same day we reached our next destination, a beautiful ashram. It is a very charged place and I was spell bound by its the energy. As soon as we got down from the car, there was this unique and beautiful fragrance that greeted us. It was a divine fragrance for sure. I instantly knew there was much more in store for us. 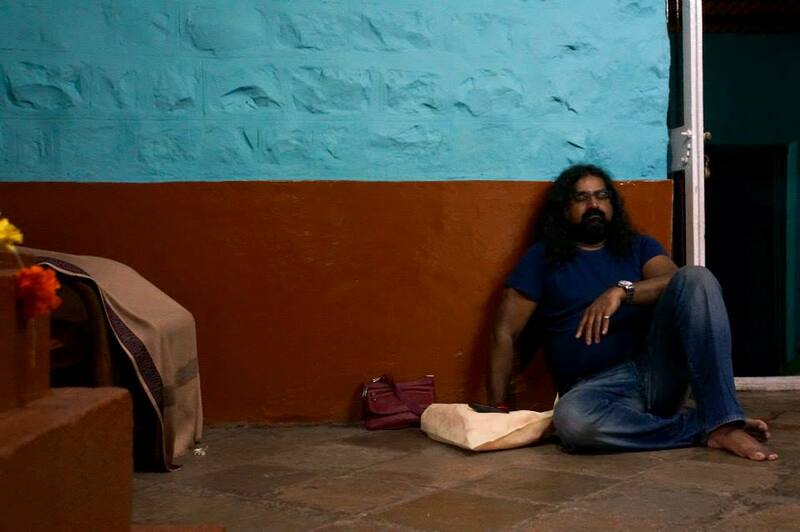 In the ashram again, Mohanji had to teach me a lesson. I was standing next to him and then Vignaji from UK came and fell at Mohanji’s feet. Mohanji immediately said, “ I love you Vigna. I make fun of people who I love a lot. What have I got to do with serious people? I leave them to themselves.” I immediately knew this was directed towards me, as I was relatively silent and aloof the whole day while travelling with him and didn’t make use of the opportunity given to me to its best. This episode also reminds me of how Shirdi Sai Baba used to give messages to his devotees near and dear to him, directly or indirectly through various means. My Baba loves me a lot and I know he is trying to help me elevate spiritually by all means. I graciously accepted the advice and thanked him again for another lesson. Final day of the retreat was the much awaited Shahi Snan, this time with more happiness than anxiety. The final dip was even more magical. While travelling to the Godavari river, we all chanted the Mohanji Gayathri Mantra until we reached the Ghats. The devotion was only getting stronger and stronger as the time was passing. We reached the Ghats to find it almost empty and a huge space left for our entire group. The river was flowing this time and hence the water was very clean. All of us along with Mohanji immediately leapt into the arms of the Goddess Godavari like eager children wanting to play in the lap of their mother. This time it was even more divine experience as we took as many dips as we wished for and Mohanji also gave us the opportunity to do ‘Abhishek’ to him. He was Lord Shiva himself for us and the divine experience and bliss is just indescribable at this holy chance. This time we also had the opportunity to take many more pictures at the ghats, and to our surprise most of the pictures had orbs or purple blue rays over many of us. The divine beings themselves had come to greet Sadguru Mohanji. What more does any one want in life? The grace of the Guru and his presence are enough to rid us of our karma and take us onto a blissful journey. All of us left the Ghats to our hotel as if in a trance. The whole event was SO BLISSFUL. My another wish for the Shahi Snan on Friday was fulfilled by Mohanji. (Not surprising eh? He fulfills everyone’s wishes all the time. I guess we are just not aware of it.) My joy was only getting multiplied by the day. Tons of gratitude to our Beloved Father. 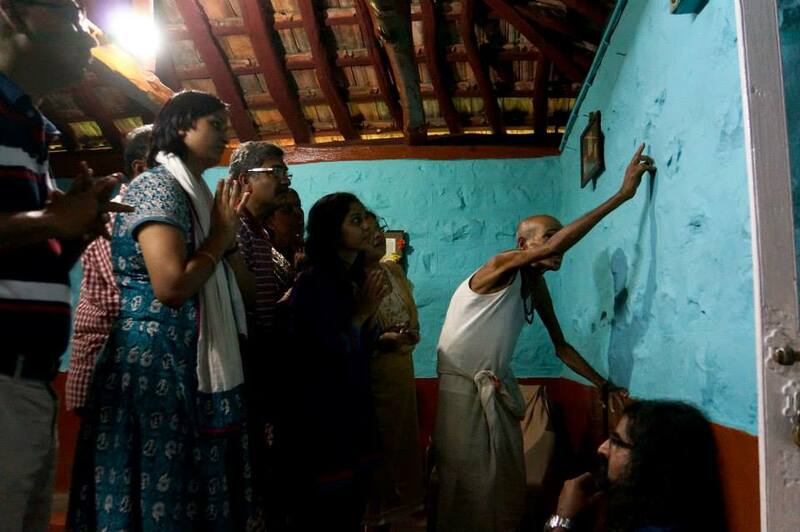 And last but not the least was the most memorable visit to Vasudevanji. 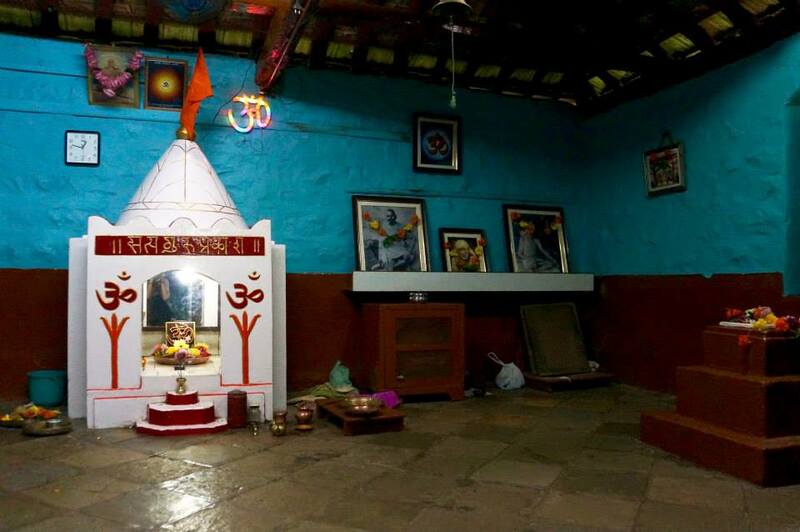 My one last wish was to visit the holy saint Vasudevan in Ganeshpuri. And since my flight was at 3.30 PM, Mamuji said that I might have to cancel the Ganeshpuri visit, as I would miss the flight otherwise. I was sincerely praying that I would get the opportunity to meet Vasudevanji. And not surprisingly, I had enough time to visit this saint along with Mohanji. The visit was so amazing. Kumb Mela 2015, Nashik – An affair to remember! It’s been my dream for a very long time to experience the Kumbh Mela in all its glory but I didn’t know I was going to get so lucky when I got to know that I could go there with my Guru Sri Mohanji. I think I did win the lottery there! I got double lucky as by the guru’s grace, we, my spouse Madhu and I, took our two young girls (aged 4 and 6.5) too. There are times in your life when you can sit back and say “That’s it. I don’t want anything more!” that was my state when I came back from this beautiful and sacred pilgrimage. 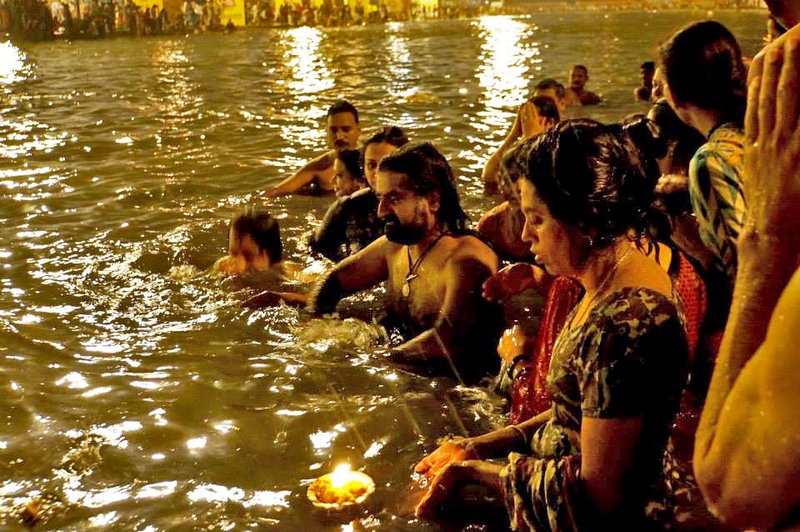 We managed to take two dips in the Godavari river on mahasnan days (13th September and 18th September). On 13th September 2015, our entire group met Mohanji at the hotel lobby at 3.00 AM in the morning. The kids not only got up promptly but got ready and were in very happy mood which itself is a miracle! I got the opportunity to sit in the Innova which had Mohanji (Father) in it. Therein started what I realised later was Father’s leela! Rajesh had done a recce a day before and he mentioned that we need to park our cars at a parking and walk 2.5 km to reach the ghats. Somewhere in the middle we lost our way and google maps was showing us many different routes! The car for an outsider would have been comical to watch with Mohanji sitting there, calm and composed and the backseat had three men (Madhu, Rajesh ad DB) desperately trying to get GPS connectivity and hence hanging out of the windows. A little behind the car, a group full of oblivious devotees in the bus with ‘Datta’ the bus driver (an ironic name indeed!) followed chanting in bliss, with no idea about the confusion in the car! At some point Father asked the guys, who were by now beginning to panic, to ask for directions at a few places. Before we knew where we were, we got down and realised that we had managed to park 5 minutes away from the actual ghat in some gulli (lane) which was closed to public. Imagine our surprise that we didn’t have to walk 2.5 km as we earlier thought we should but reached the ghat in 5 minutes and we managed to find a spot for our snan at a place which had very few people. So we could actually take a relaxed dip in brahma muhurth, without the push and tug and the maddening crowd we were expecting. It was unbelievable to say the least! 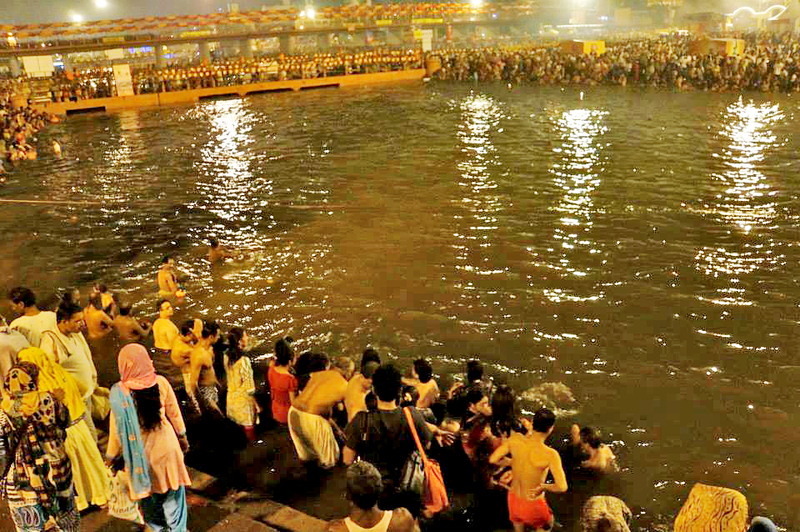 As Father entered the river for his dip, all of us followed and the whole place was charged with amazing energy. Bhakti, joyous devotion and sheer gratitude for what we were experiencing was evident in every face I saw. Once we finished the dip where each of us had taken dips for our guru and lineage, ancestors, family and friends we came out feeling completely fulfilled and took the blessings of Father our Sadguru. He was looking so mesmerising with the majesty of Lord Shiva, compassion of Sai Baba the love of Dattatreya all rolled into one; Mohanji our Father, Parabrahma, the light of our heart, in Nirguna and Saguna state. Simply Blissful indeed! As I was standing next to him I got a very strong fragrance of vibuthi or sacred ash (udhi) and I commented about it to Mohanji. He had a twinkle in his eye when he asked me why I was surprised by it. That was when I realised the significance of one’s own experience. To read about it in books or to hear about others’ experience is good but when you have your own experience it instills the deepest faith in you. I also understood the significance of why it is important to write our experience – the mind keeps questioning and negating and creating doubts all the time as that is its nature. But when you have your own experience and record it somewhere, then it’s not very easy to shake your faith. Deepest gratitude to my guru, Sri Sadguru Mohanji Maharaj for his grace and love. Deepest gratitude to everything and everyone who helped us in making it to the Kumbh Mela at Nashik. Another amazing experience I would like to share is the visit to Ganeshpuri on our way back from Nashik. 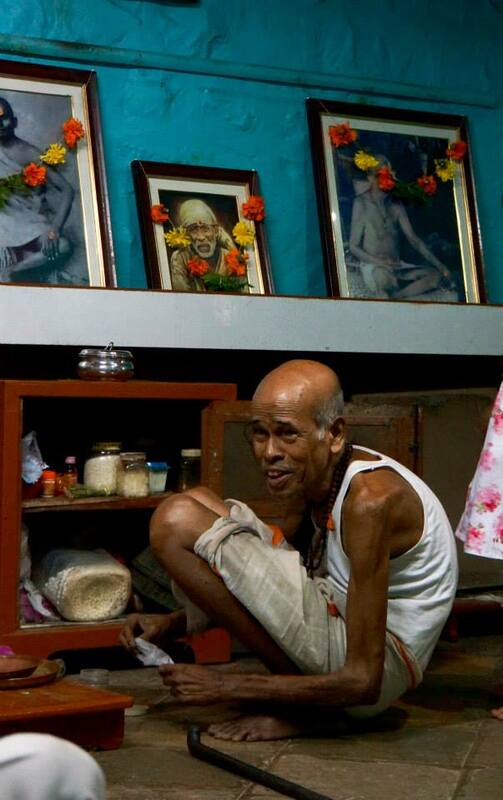 Father said he would like to spend time with Vasudevan swami (a highly evolved saint at the Nath mandir in Vajreshwari). He asked us to proceed to take darshan at Nithyanand Bhagwan’s (Bade Baba’s) Samadhi and meet him back at Vasudevan swami’s place. It did cross my mind why he did not want to come to the Samadhi mandir after coming all the way to Ganeshpuri. 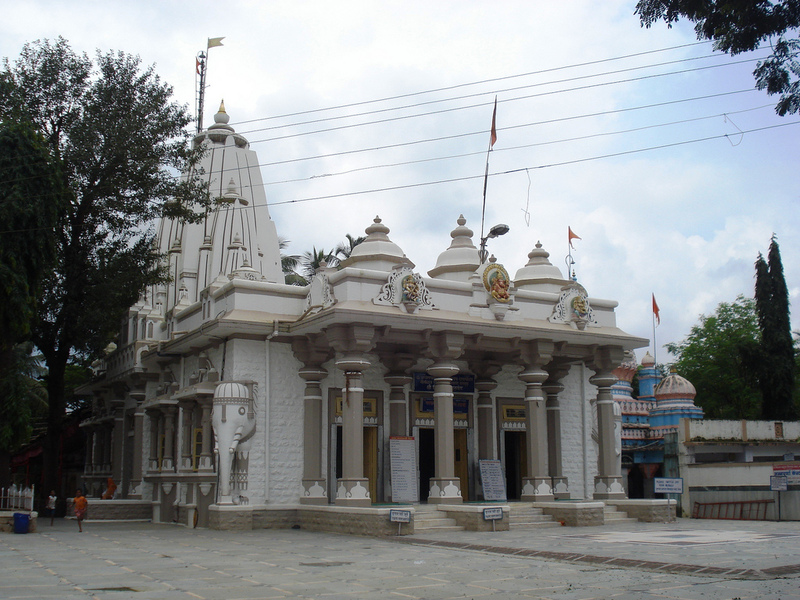 We dropped father at Vasudevan swami’s Nath mandir opposite Vajreshwari temple and went to Bade Baba’s shrine. There is a room opposite the bath tub which is sometimes open to visitors. This was where Baba used to sleep. The last couple of times the room was open and we got in and meditated there for some time. I tried to open the door but it was locked. I put my head on the door and peeped in and thanked Bade Baba for this darshan when I got a very strong fragrance of vibuthi once again coming from inside. I instinctively recognised it as Mohanji’s fragrance, the same one I got at the snaan. As I kept my head there I also got a strong smell of sandalwood and after a while I could smell other multiple fragrances coming from the room. Madhu, Nikunj, Arusha and Vidya each put their head there, smelt the fragrance and their forehead began to pulsate as the energy inside was very high. Every single one of us were amazed! 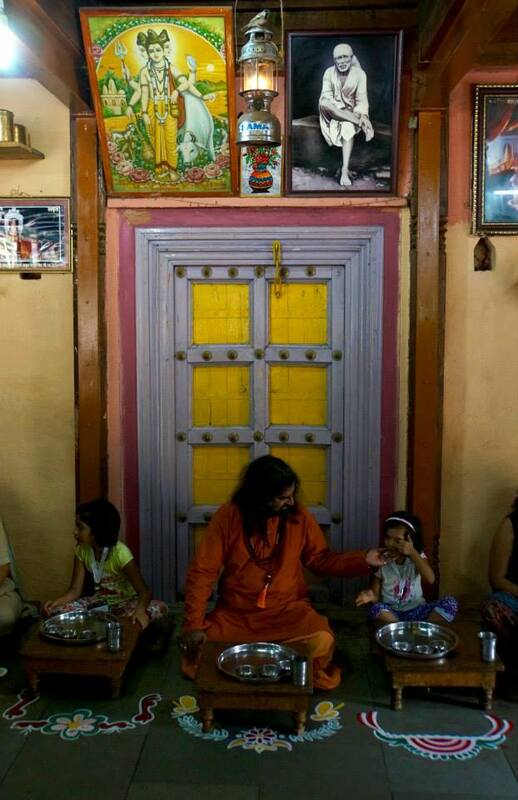 At that moment we knew Mohanji was inside with Bade Baba and I felt a couple of other masters were there too. We then went to the Samadhi mandir right in time for Aarti and needless to say the darshan was magical. We left after the Aarti without waiting for the Prasad as others in the group would be waiting for us at the Nath mandir. Once we went there I saw Mohanji and asked him what he was doing at the Kailash Bhavan? To which he replied with the same twinkle in his eyes that he did not have to be physically present at Ganeshpuri to take darshan of Bade Baba. He also confirmed there were a few of them there at the room. It was an amazing moment for me as a reconfirmation of how one’s own experience cuts out the doubts set forth by the mind. By the end of our trip I understood that what we see physically is a miniscule of Father’s stature and presence. I remember what he told me when I met him at the Mumbai centre, “Try to understand me then you will never leave me”. My single prayer to him is to help me understand him, as I would never want to leave him ever and I pray it always remains that way. Bless me Father that I feel your grace at every step and remain sincere and truthful to what you stand for. Jai Mohanji! 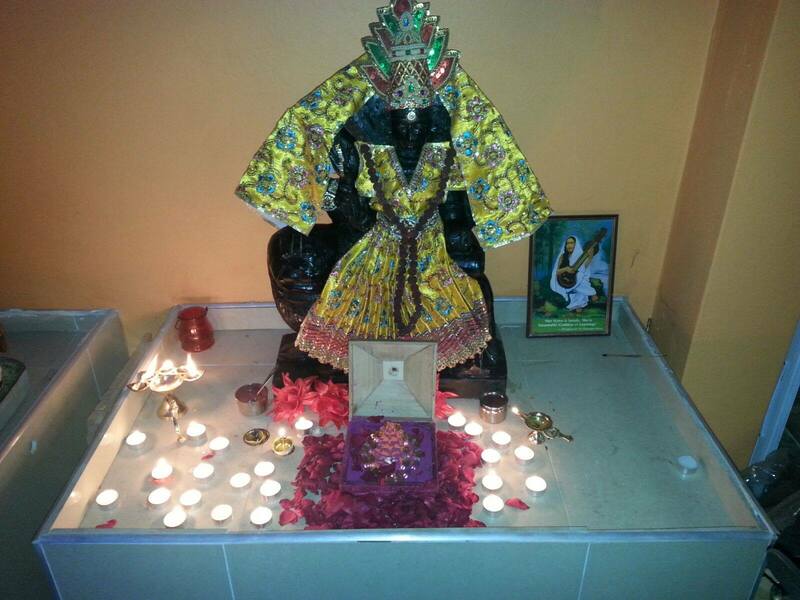 Dattatapovan has been having pujas everyday to celebrate Navarathri. Friday was a very special day for us. 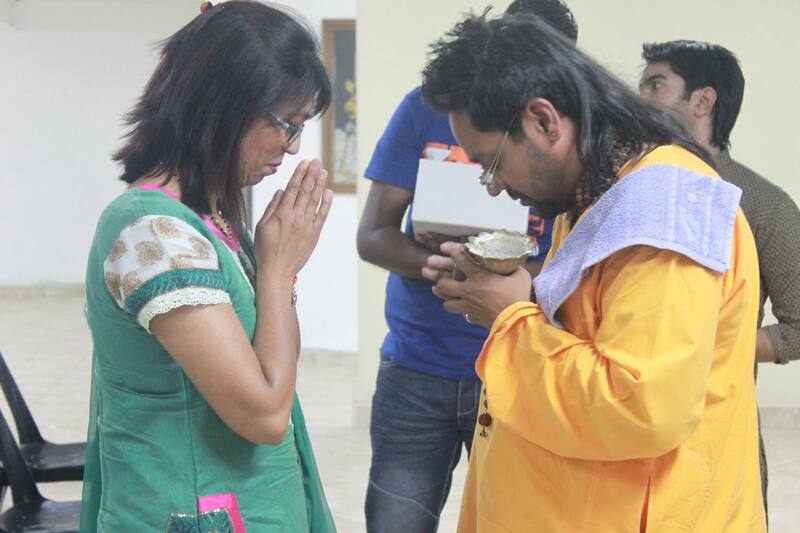 Everyone at the ashram participated in a very special prayer to Shree Lalitatripurasundari. We all individually worshiped the Shree Chakra according to the navavarna puja technique. 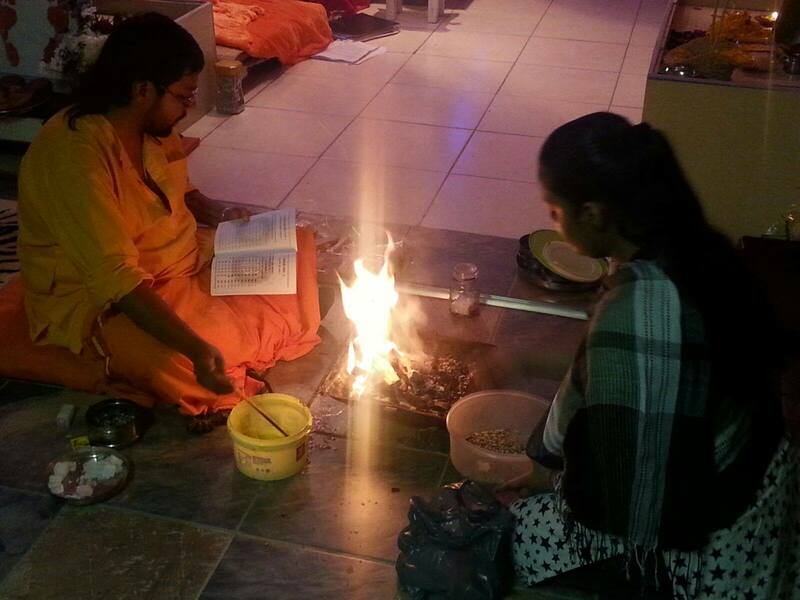 Everyone patiently offered sindoor and rice to various points in the Shree Chakra. 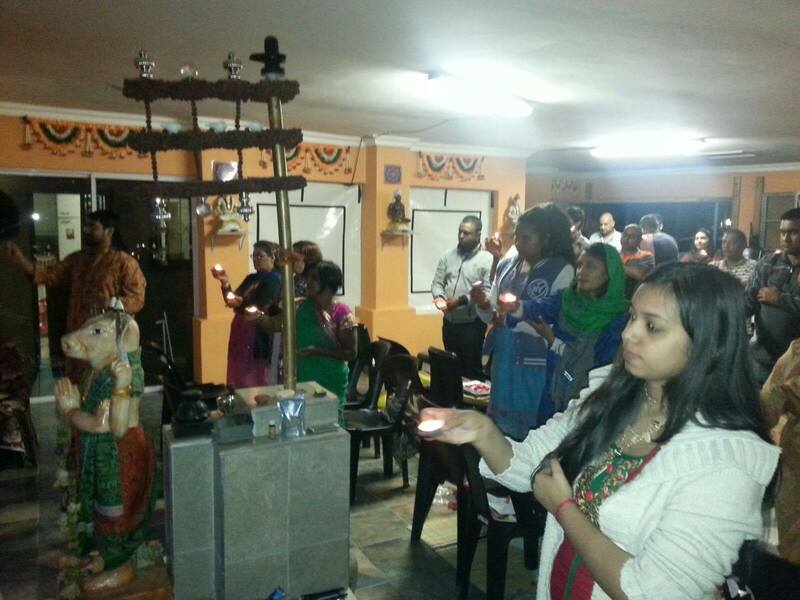 During this evenings pujas at Dattatapovan. 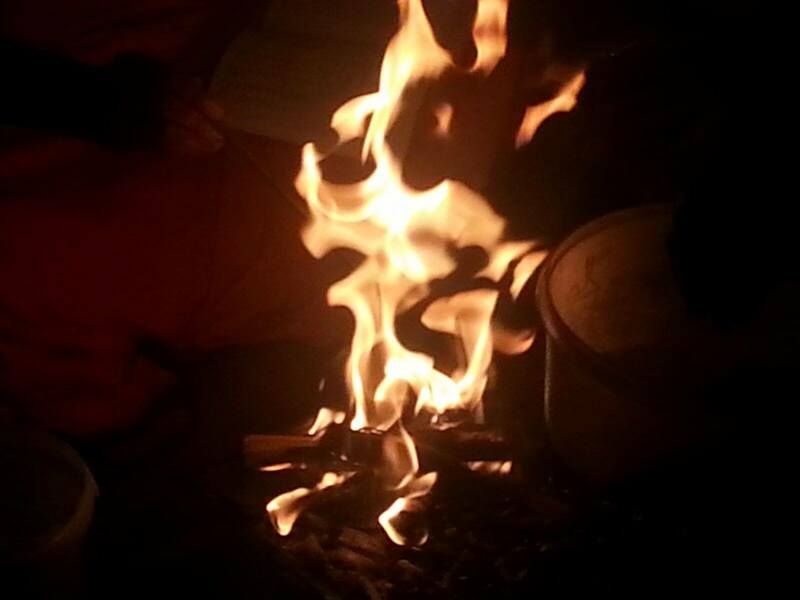 Devi Durga and Lord Ganesha on her lap, siting on a lion appeared in the flames. During this evenings pujas at Dattatapovan. Devi Durga and Lord Ganesha on her lap, siting on a lion appeared in the flames. What an amazing evening. Today we did Durga Saptasati homa. It was really such a blessed evening. Mohanji showered his grace upon us all. So so so blessed. 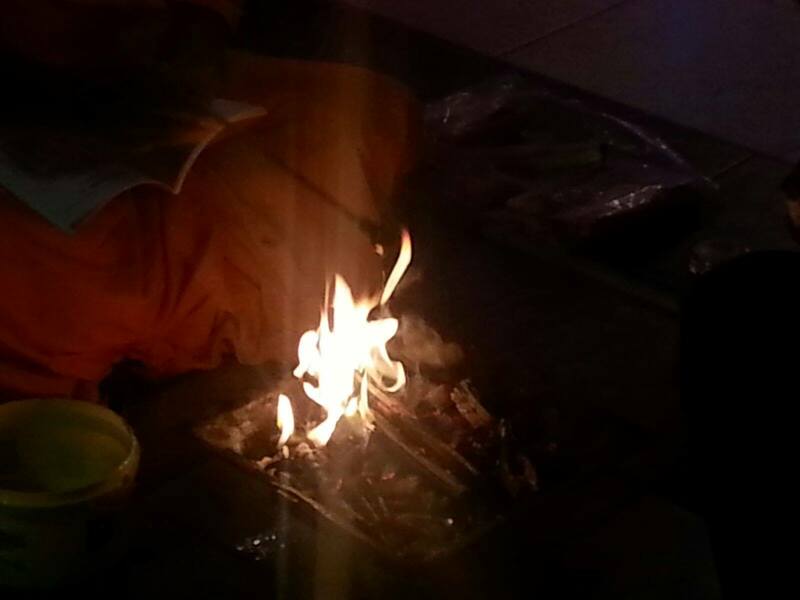 Devi make her divine presence known in the flames of the homa. Thank you Mohanji for such blessings. A Power of Purity mediation was held in Newcastle earlier this month. I can’t begin to explain what an amazing experience it was. Because it was pithar pak, I did not expect many people to come. But I knew, who was meant to be there would come. Mohanji says he always does his job, and he definitely did. 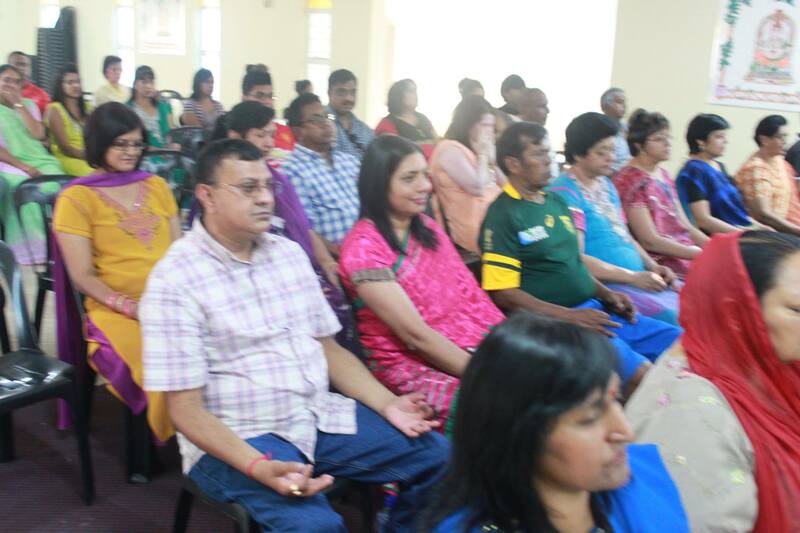 Through Babajis grace, 45 people attended the meditation. I was so touched by the love and respect everyone showed towards Mohanji. Babajis grace flowed and his presence was definitely felt. During the short satsang, I could feel him walking around and he blessed each person there. So many people had visions during the mediation. One participant felt a strange sensation over his body and he opened his eyes. He actually saw a dark cloud move out of him, leaving him feel light and empty. Mohanji answered many participant’s personal questions without even being asked aloud. This left everyone in a state of complete surrender. Babaji you touched so many lives in Newcastle. On behalf of everyone, we would like to say that we are so grateful and thankful for your blessings. e about Devi Lalita, her meaning, the meaning of her yantra, some philosophical aspects of Shree Vidya and chanted her shodasi mantra. 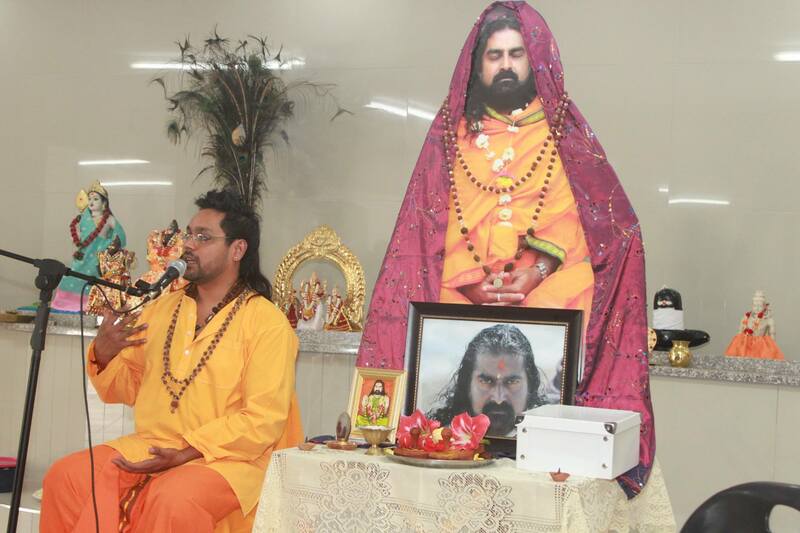 Thank you Babaji for such a wonderful experience. Everyone had such a good time because of your blessings.